The Dining Room of Monticello, with the Tea Room adjacent. In recognition of the upcoming Thomas Jayne Event sponsored by Decorative Arts Trust, presented in a previous post of The Devoted Classicist, there is a return to Thomas Jefferson's Monticello to discuss the Dining Room; the adjacent Tea Room is discussed in Mr. Jayne's book THE FINEST ROOMS IN AMERICA. 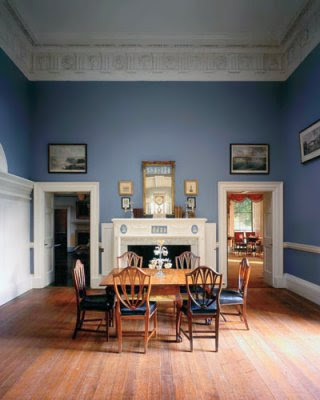 The Dining Room at Monticello, showing the previous blue paint scheme. Note the open doors of the dumbwaiters flanking the fireplace. The interior paint colors that many think of as "Colonial" or "Williamsburg" are often a result of 1930s interpretations rather than actual historic colors. Today, there is more interest in accurate restoration rather than "tasteful" re-creations, and science combined with more academic knowledge of history often allows a more authentic presentation in house museums. 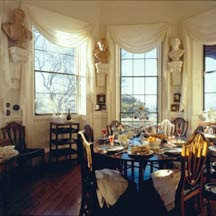 The Dining Room of Monticello as it appeared in 2010 with a table setting by Charlotte Moss. (The table was set up in the room during Jefferson's time only as needed). Utilizing analysis and studies by Welsh Color & Conservation, Inc., it was determined that the walls of Monticello's Dining Room and Tea Room were orginally white unpainted plaster. But Thomas Jefferson loved the most stylish and fashionable trends in decoration as much as he loved to entertain. So it is no surprise that Jefferson had the Dining Room painted in 1815 a new color, chrome-yellow. 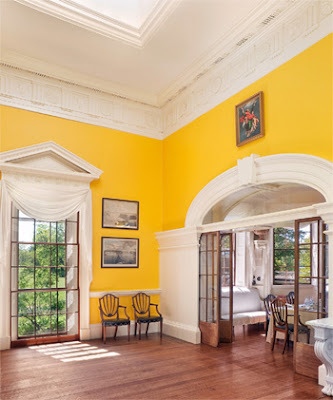 In a 2010 article by Mitchell Owens in Elle Decor magazine, the curator of Monticello Susan R. Stein describes the bright yellow as "the color of an egg yolk from a chicken that dined on marigold petals." And Ms. Stein added that the chome yellow pigments cost $5 per pound as compared to 15 cents per pound for basic white. 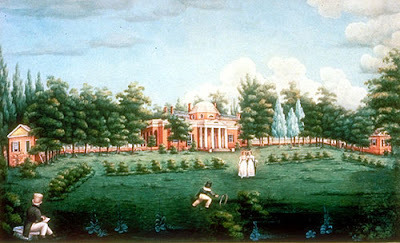 An 1825 watercolor of Monticello by Jane Pitford Braddick Peticolas. The Dining Room and Tea Room are to the left of the central portico. 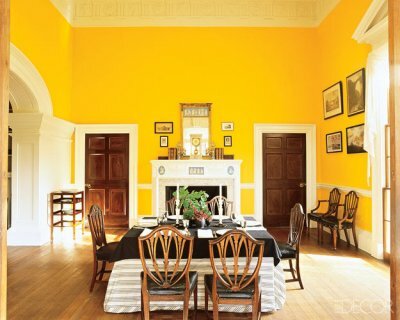 In 2010, a donation from Polo Ralph Lauren, which included exclusive rights to market Monticello Yellow paint, allowed the Dining Room to be repainted the bright golden color. 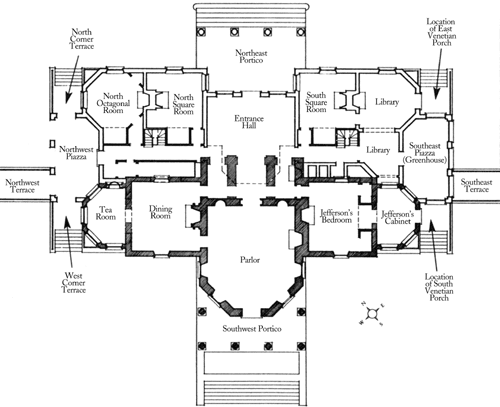 The First Floor Plan of the main block of Monticello. The Dining Room is almost a cube, 18'-6" x 18'-0" with a ceiling height of 17'-9". There is a skylight, one of the thirteen in the house. The window has two sets of sash for insulation with double pocket doors on rollers separating it from the Tea Room (which was cold). A dumbwaiter on either side of the fireplace brought wine up from the cellar and a revolving serving door (recreated in 1949) with shelves attached to the service passage side enabled dishes to served and cleared with minimal intrusion by Jefferson's servants which were slaves. A view from the Dining Room into the Tea Room. The Tea Room is 15'-1" x 11'-2" with a 17'-11" ceiling height. 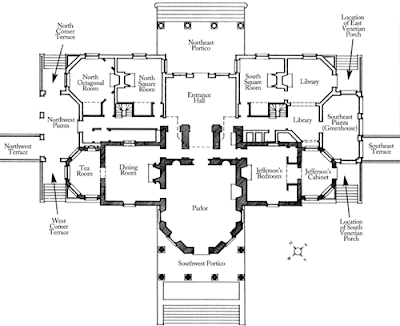 The plan is based on an octagon (though not complete), Jefferson's favorite architectural shape. The room was inspired by a building in Albano, Italy, depicted in the 1650 book by Roland Freart de Chambray PARALLELE DE L'ARCHITECTURE ANTIQUE AVEC LA MODERNE, an anthology of ten ancient and modern writers on the classical orders. (An English translation by John Evelyn, the second edition published in 1706, is available in facsimile form here). The Tea Room at Monticello. 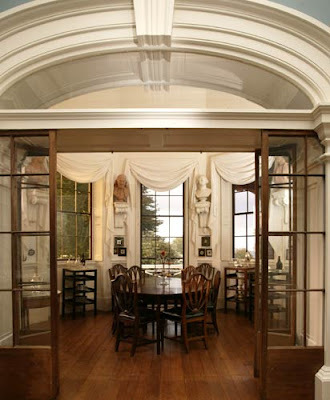 The Tea Room is decorated with busts of Benjamin Franklin, John Paul Jones, Marquis de LaFayette, and George Washington, friends and American heroes. The room was used for dining as well as reading and writing. The semi-circular niche held a heating stove at one time. The walls are now painted to replicate the original unpainted white plaster. The Dome Room at Monticello. The Dome Room is now painted "Mars Yellow" and the wood floor is painted green. Except for a brief period when it served as an apartment for oldest grandson Thomas Jefferson Randolph and his wife, the space was generally unfurnished and unused, other than for storage, during Jefferson's time. For more about this room, see the webpage of Chris Kern here. 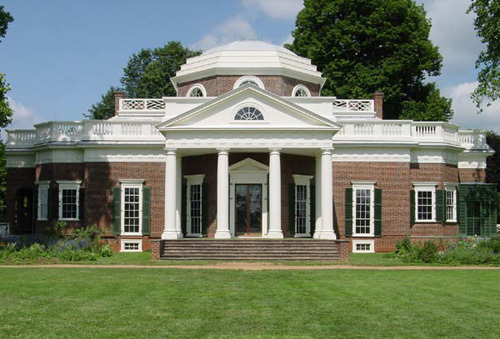 The west elevation of Monticello. Sometimes called the "Nickel Front" because of its depiction on the U.S. coin. More changes are in the works to return other rooms to their appearance during Jefferson's time. Monticello, located on the outskirts of Charlottesville, Virginia, is one of this country's most-visited historic houses. The experience of touring the estate first-hand is a memorable one and information about visiting can be seen at the official website. UPDATE: The new carpet that was custom made for the Dining Room may be seen in the post of THE DEVOTED CLASSICIST blog here. That is the most wonderful yellow. We had something similar in Amsterdam - a room washed in dilute chrome yellow gouache and then varnished. It was uplifting even on the greyest of days. nod... it IS the most visited house. When I was there a few years ago (1994? ), there were tourists everywhere. Our guide was a most knowledgeable and stimulating bloke. But here is the question. If we all agree that accurate restoration rather than tasteful re-creation is the goal, we may be stuck with inconsistent or less than gorgeous results. Orginally white unpainted plaster in the dining room became chrome yellow overnight when Jefferson fancied yellow. If five years later Jefferson turned to ruby red, should the current dining room be changed to ruby red? Or should it go back to white plaster, as it was originally? Blue, I always gear colorations to the specific locale. There can be so many factors involved with light and how colors are perceived. Thanks for commenting. Hels, I think there always has to be the question of interpretation when presenting a house museum. The next post goes into that a little deeper with another property. John and Hels, I'm interested to see how his discussion evolves. A few years back, after the restoration of the Swan House, hallway columns which I seen painted terra-cotta during a private tour before the house was reopened, shortly after were painted white as they had been before the restoration - despite paint scrape and spectrographic evidence to the contrary. John, I agree with you about the many factors in perceiving color and light. I wonder how often orientation and latitude is considered nowadays when color is chosen. Nice photos, thanks for the post. Isn't it amazing how bright and bold Jefferson's color taste was? He must have had quite a flare! I'd love to pay a visit sometime. Blue, there is more to be revealed. L.A. and L.L.L., the bold color of the walls compliments the architecture of the room, doesn't it? T.D.M., thanks for commenting. I was glad to learn of your blog. I wonder how long the yellow color was kept up; it seems a bit bright to me, too relentlessly cheerful. I am crazy about the Peticolas watercolor. It is charming in itself, and it gives the building a sense of scale and context which is usually lacking because I usually see Monticello represented in close-up. P., the Dining Room walls were wallpapered before being painted blue. But a Hemmings descendent recently said that there was a story that had been passed down in the family that the Dining Room had "Walls of Gold". The watercolor is so charming that I could not resist including it as well. As part of the recent changes, one of the pavilions has been refurnished. Dahhling... who doesn't love Monticello? 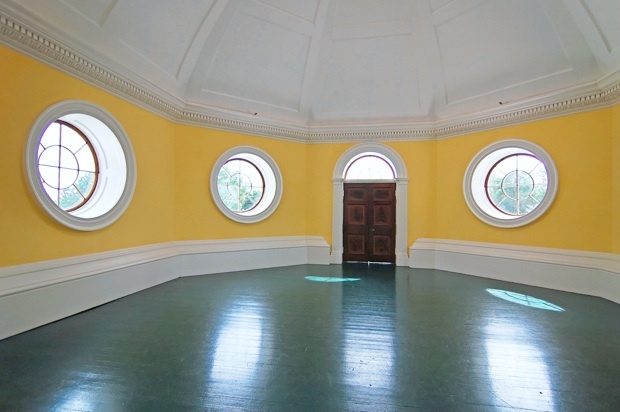 that yellow is so dramatic particularly in the Dome Room... just perfection! Your blog is fantastic! It is academic but interesting! The Thomas Jayne lecture was so inspiring, too! It was worth the trip to meet you both! HRH, the ceiling panels in the Dome Room were previously painted blue. In this case, I think white works better for the whole dome. There are "Behind The Scenes" tours that allow this and other areas, not suitable for the general public, to be viewed now. 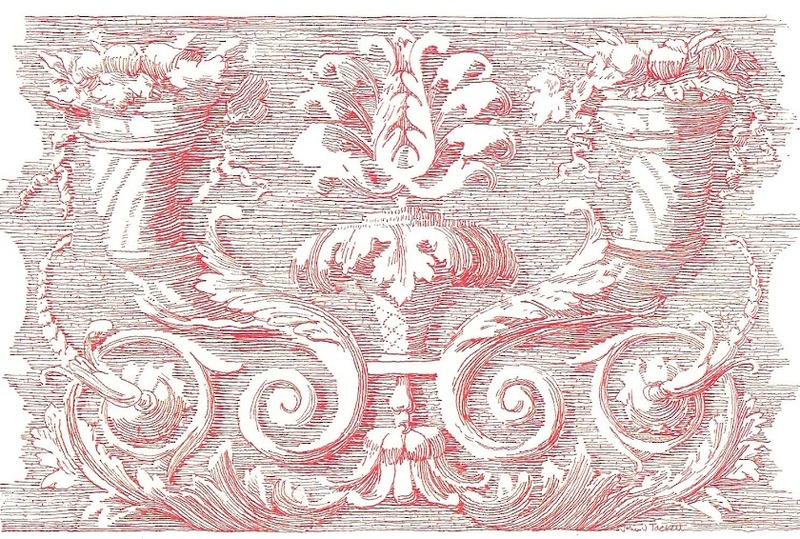 Historic paint research, and historic decoration are subject of endless fascination to me (add to that early wallpaper). In a local Federal era house here, wallpaper removal revealed an early dado painted chrome yellow below the chair rail. One so wonders what the wallpaper above might have been. I think I must, must hie myself off to Monticello this winter. So, perhaps we could dragoon DED into joining us? Reggie, that would be fun. I wonder if Bremo Plantation would be a possibility, too? Wow that yellow is bright! T.D.M., we tend to forget how much appreciation there was for rich, bright colors in the late 18th and early 19th century, especially. In the next post, we'll take a look at a neoclassical room that was reinterpreted with a beautifully subtle paint scheme almost 200 years later. Nicely done. Looks more elegant. Click Here for A FREE Estimate from Painters in Hamilton and you will have the best saving options available to you.